August Schreitmüller's (1871-1958) sandstone statue "Gute" (The Goodness) overlooks the ruins of Dresden in 1946. In this photo taken by Richard Peter (May 10, 1895 - October 3, 1977) for his book Dresden-eine Kamera klagt an (Dresden - A Camera Accuses) published in East Germany in 1949, he stood on the viewing platform of the Dresdener Rathaus (Dresden City Hall) to photograph the ruins of the city south towards the Elbe valley and the district of Sächsische Schweiz (Saxon Switzerland). A veteran of World War I, he worked as a photographer for socialist publications in the twenties and thirties. The Nazis refused to grant him a press pass in 1933 and he worked in Dresden until the war, when he was drafted to work on a flak battery in Vienna. 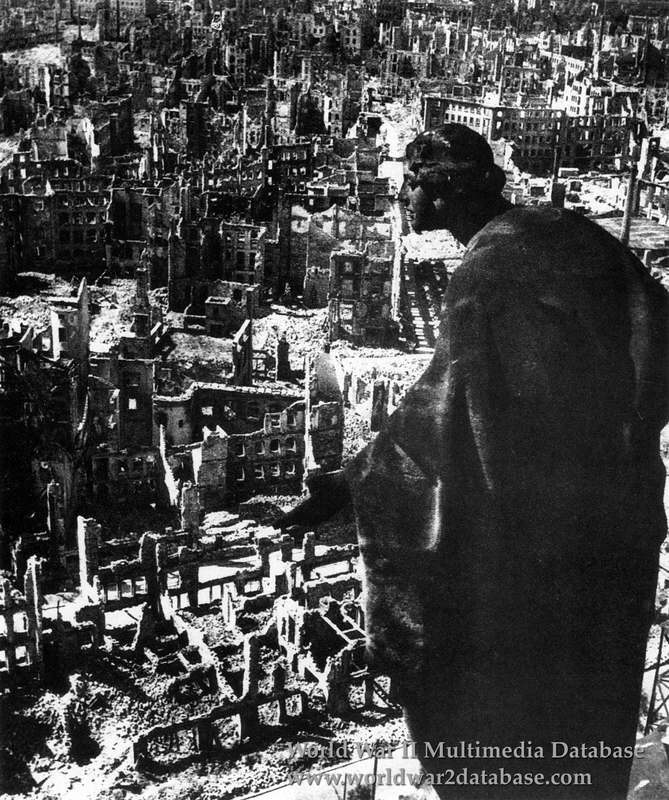 Over the period of February 13-15, 1945, the Allies dropped 3,900 tons of explosives on Dresden's city center in four raids by the Royal Air Force at night and the American 8th Air Force by day. The sustained bombing combined with weather conditions to cause a firestorm of superheated winds at 1500 Celcius (2700 Fahrenheit). Packed with refugees from the East, some 850,000 people or more were in and around the city; hotly disputed casualties are estimated to be at least 25,000. 13 square miles (34 square kilometers) were destroyed; 90% of the city center was burned out. Most casualties were killed not by burning, but by the lack of oxygen as the fire consumed breathable air. Peter returned to Dresden to find his studio destroyed; borroing camera equipment, he documented the destruction and called for rebuilding. The book also contains graphic photos of the firestorm's victims, many of whom were uncovered in 1946. He was cast out of the East German Communist Party the same year the book was published for criticizing corruption. Photographer Walter Hahn also photographed this same location, choosing a landscape with a wider view instead. Dresden still had scars from the bombing in 1959; some buildings, notably the Frauenkirche (Church of Our Lady) were reconstructed only after reunification. Bodies continued to be found in Dresden through 1990.